An education abroad can change your life and transform your career for the better. Students of Indian origin are travelling in higher numbers than ever before to pursue higher education abroad. Nearly 85% of internationally mobile Indian students head for five countries: the US, UK, Australia, Canada and New Zealand, but China and Germany are both emerging destinations for Indian students heading abroad, though the numbers heading for Germany are still relatively small. Romania has emerged as one of the best destination for studying Medicine among Indian students as the education system is regulated under European Union and quality is relatively better compared to Ex-USSR ( CIS Countries ), China and Philippines. Many Indians have chosen to study in Denmark and Norway. These Scandinavian countries offer many professional courses. There are about 100 Indian students in Poland studying many subjects such as economics and management. For MEDICINE Studies especially in government universities of Romania, Bulgaria and Hungary is also a preferred destination for Indian Students now. The number of students studying in USA has gone up 94,563 to 103,260 in 2010–11. Most of the students choose either east coast or mid-west as their destination in US. The number of Indian Students studying in the UK has nearly doubled between 1999 and 2009. In 2009, 19,205 Indian students were studying at UK institutions. As of May 2010, half of all Indian Students studying in the UK were studying at the Postgraduate Level. Australia is back as the second favourite choice for Indian students after a downturn for several years after 2009 when a number of racial attacks led to a drop. In 2015 Australia crossed its previous peak for international students in 2009. Australia is emerging as a popular destination for Indian students. During 2013-14, 34,100 visas were issued to Indian students, a rise of 38% as compared to the previous year. As of 2014-15, there are approximately 11000 Indian students studying in Germany which comprises 4.9% among all International students in Germany. The number is rising continuously. German universities have started offering several masters program in English thus attracting a large chunk of Indian students. Deciding upon studying abroad can be a life-changing decision! Education plays the most important role in shaping up one’s life, personality, thinking and most importantly what one wants to achieve and become one day. Studying abroad can be a significant part of a well-rounded education. Where you can have exposure to world-class work experience and not just this but also to some mind freshening and energizing places that will keep your spirit high! There are some obvious things you’ll need to be aware of before you go, but you should be ready for more than just a language and culture barrier. With proper preparation, your study abroad can be one of the best experiences of your life. Studying abroad can be a lot easier when you have all the required documents right with you! You will be asked to show your passport as you leave the United States, as well as when you enter the new country. 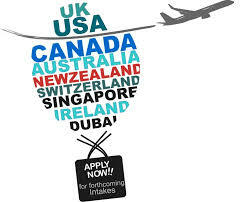 You may also be required to have a visa for studying abroad; this all depends on the country you are headed to. To keep your trip trouble free experiences keep your passport handy! Also, you may carry a pen along while travelling in a plane as you’ll likely need to fill out a bit of paperwork before entering your study abroad destination. When it comes to travelling, travel cost is the most likely thing to worry about! Gift yourself the peace of mind by purchasing the tickets in an appropriate time, Actually, the most ideal-time to purchase your ticket is in the three-month range prior to your departure, as this is when the price is typically the lowest. You will likely be travelling with a few of your most prized possessions in town, maybe your laptop, your Smartphone, your iPod, your passport, some nice jewellery, or money. It is essential that you actively make an effort to keep track of your belongings. One of the greatest frustrations you might encounter while studying abroad is a blunder with your bank. Make sure you alert them in advance and give them specific dates about when and where you are studying abroad. In this way, you will significantly decrease the chances of having an “uh-oh” moment when your ATM card or credit card is declined suddenly. Make your study abroad trip a wonderful and enriching experience by knowing more about the host country. Talk to alumni of the study abroad program to get a sense of the successes and struggles of their experience. Talking to others who have completed the same program will give you a chance to ask specific questions and allay any fears you might have. Since you got to spend a good amount of time in the host country get familiar with its culture and cultural norms. As it is really difficult to adjust immediately in a new country with a different culture, having knowledge about it beforehand can make your stay a little easy. You never know what kind of resources are right under your nose. Let your plans to study abroad be known, and tell people exactly where you’re going. Someone you know might have family, friends or another local connection that could end up being invaluable. Show your smartness by packing your stuff just according to the countries climate. For example, if you’re studying abroad in Sydney, Australia, during the fall semester in the U.S., you should be prepared for spring and summer weather. Find out if you will need any special equipment, like heavy-duty snow gear, for example. Pack copies of important documents, such as plane tickets, passports and credit cards for reference in case of an emergency. It’s a good idea to have a list of emergency numbers available just in case you need it. Include the numbers of trusted local contacts, your parents, your university, the embassy and other organizations that can help you get out of a jam. 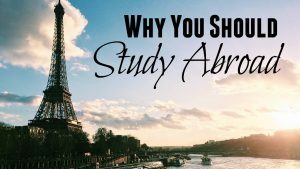 Whether you’re funding study abroad yourself (like me! ), splitting with your parents or just looking for a way to help your parents save some cash, here are some tips and tricks to saving to study abroad on your own! “Ugh, I need a job.” The mantra of college students everywhere. Although it’s people’s impression that there are “no job openings” ever, I’m here to tell you that there most definitely is. More often than not, people just aren’t willing to give up their Friday and Saturday nights for some extra cash. Especially if they pay is only minimum wage. I will be totally honest, you WILL NOT make even a fraction of the money you want to save to study abroad at a minimum wage job. It’s just not possible unless you start saving about 3 years in advance. As students, you are most likely unable to work full time, so working a minimum wage job for 20 hours a week just won’t cut it. To this I say, just say no (to minimum wage!) There are plenty of jobs that don’t pay minimum wage. Do your research, ask your friends, shop online. There are many ways to make a higher wage or gain tips to increase your income. With that being said, you need to be prepared to sacrifice a lot more of your time and effort in exchange for a higher pay. Having worked for In-N-Out Burger, who are known for paying their employees well, for over year, I can vouch that I definitely EARN my money. I work 35 hour weeks quite often and don’t get home until 3 am some nights. It’s worth the work when you get that paycheck and think about that weekend trip to Berlin you’ll get to take while abroad though! Some universities have specific programs that they encourage students to go to more than others. For my school, Chapman University, they encourage students to choose to go to Prague, Czech Republic by paying for their round-trip plane ticket. That’s about $1,500 I’m saving for doing nothing! So make sure to research all the programs your university programs offer and look into whether or not one is subsidized or sponsored by your school. A recent trend that has emerged among students is creating online crowd-funding campaigns to garner donations from friends, family and anonymous donors who believe in what you are trying to accomplish. If you are paying to study abroad yourself, you probably have a unique story to tell. People will be able to read about your story and know more about you. Some unexpected donors will definitely emerge! The best way to gain exposure is to email it out to every family member (extended and immediate), family friends, friends of your parents and to post it to Facebook around once a week. People will be turned off if you spam them with it too often, so post it/tweet it/Instagram it sparingly to keep people on your side! Do your research– Know what percentage the website platform will be taking from the donations. Set an achievable goal– Platforms will take a higher percentage if you don’t achieve your goal so keep it realistic! Promote your campaign– Social media is the easiest route to go, but don’t be afraid to reach out to blogs or publications that may be interested in featuring your campaign. Take a look at my crowd Funding Campaign for ideas on what your story can look like and perks you can offer to your donors. “Commuting” is the most unappealing term for many college students who love their independence. When it comes to studying abroad, though, sacrifices must be made. If you are fortunate enough to live within commuting distance of your college, this is definitely a viable option. If you are paying your own rent and utility bills, moving home can save you a boatload of money. Even if you choose to pay your parents rent, like me, you can still save hundreds of dollars each month on little costs, such as groceries. Not so glamorous, but an extremely practical and effective way to save money! One option that myself and a few other people I know have done is to take out a private loan from your parents. This isn’t your parents paying for the trip and you hope they won’t make you pay it back. Your parents won’t bite. The way I am doing it is that my father has drafted an official document that outlines a set amount that will be loaned and the time frame I will be granted to make monthly payments to pay off the loan. If it is within your means, start paying the moment you get back from being abroad, or you can request to defer the payments until after graduation. Sign the form. Enjoy the loan! Elect to study abroad in spring and enjoy a nice influx of cash when you get your tax return around April! Most students working in a college with a properly filled out W-2 Form can expect to get a decent size tax return halfway through their study abroad semester (a thousand or so in my experience.) Even better, request that your parents do not claim you as a dependent and you’ll get a little extra cash thrown your way! One of the biggest factors to consider when choosing somewhere to study is the cost of living in that city. Are they on the Euro? The Pound? The Swiss franc? The strength of their currency can have a serious impact on the amount of money (US Dollars) that you end up spending while abroad. For instance, one of the reasons I am choosing to study abroad in Prague is because their currency is the Czech koruna, which is not all that strong. Typically countries with a less valuable currency will have a lower cost of living which, in turn, will allow you to save more! Check out sites, such as www.numbeo.com, to determine where you’ll get the most bang for your buck! The biggest advice I can give for paying to study abroad on your own is to start planning early. By early I mean a year in advance at least, possibly more. Knowledge is power and you need to know exactly what is expected of you financially when the time comes to start paying fees. The worst feeling would be getting all amped to study abroad and then have to withdraw because you were not prepared financially!. Now, when you basically know everything about STUDY ABROAD, then wait or stop now. Go on and explore some of the best countries for Indian Students.